Soil electrical conductivity, referred to as EC, is the ability of soil to conduct (transmit) or attenuate electrical current. EC is expressed in milliSiemens per meter (mS/m) or at times is reported in deciSiemens per meter (dS/m). 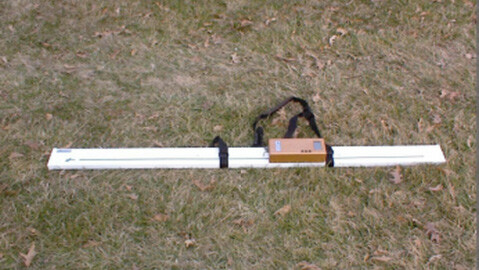 Over the years, soil scientists have used EC to measure soil salinity. However, soil EC measurements also have the potential for estimating variations in soil physical properties where soil salinity is not a problem, including texture, moisture, depth of top soil plus others. The important aspect to remember is that anything that affects conductivity in the soil will influence measurements, so it is important to ground reference to understand the driving variable(s) for soil EC measurements. 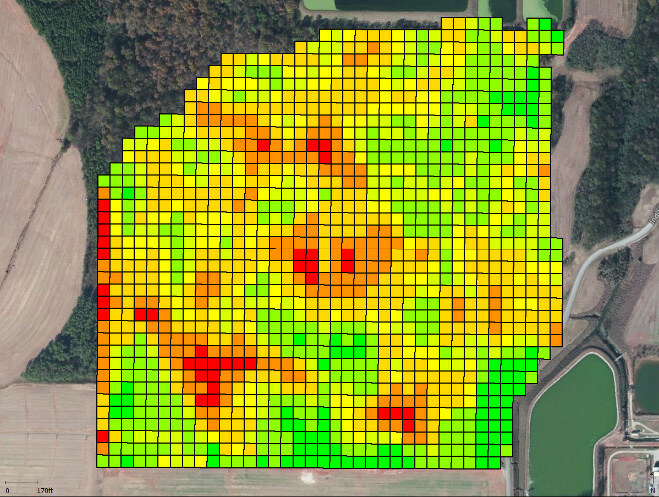 Agriculture Technology Providers (ATPs) and Precision Ag Services use soil EC sensors to generate EC variation maps using them as base spatial layers for site-specific management of inputs, practices or other management decisions. This fact sheet serves to provide growers and consultants with an overview of soil EC sensors and potential use within Precision Ag programs. There are two types of sensors commercially available to measure soil EC in the field. They represent two distinct methods for collecting soil EC measurements: contact or non-contact. The following provides an overview of each. This type of sensor uses electrodes, usually discs or coulters, that make contact and penetrate the soil to measure the electrical conductivity. 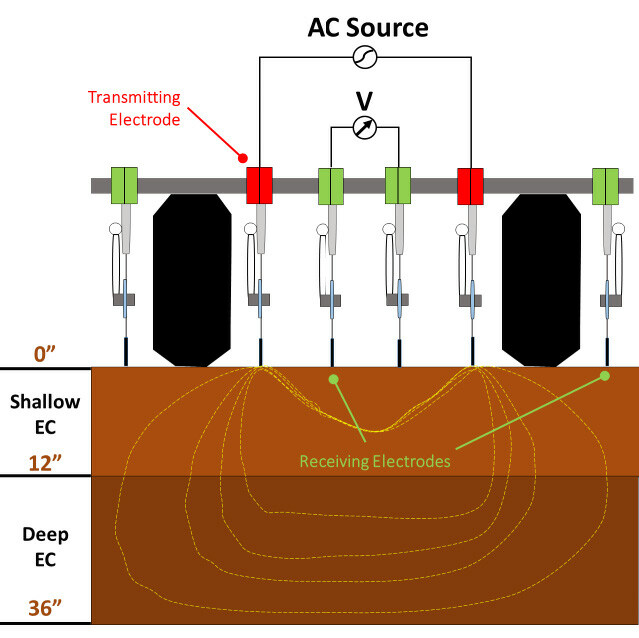 In this approach, two to three pairs of coulters are mounted on a toolbar; one pair applies electrical current to the soil while the other two pair of coulters measure the voltage drop between them (Figure 1). Soil EC information is recorded using a display with data logging capabilities that records both soil EC measurements and tags them with position information provided by a Global Positioning System (GPS) unit. The contact method has been more popular for precision agriculture applications since it can efficiently cover more area and is less susceptible to outside interference. The disadvantage of this system is that it is usually bulky and cannot be used in plots (40 x 40 feet or similar size) or small fields (less than 5 acres). Currently, Veris Technology manufactures the contact type of EC measuring device that is popular among precision agriculture service providers. Veris offers different types of units for measuring soil EC, with the V3100 representing the base unit common for field measurements. The V3100 unit provides EC readings from two different depths (1 foot and 3 feet). The Veris V3100 unit can be pulled behind a truck or tractor through the field at speeds of up to 10 mph covering swaths of 20 to 60 feet wide, depending on the desired resolution or amount of soil variability in the field. Figure 1. Contact style soil EC sensor that measures at both shallow (0 to 12 inches) and deep (0 to 36 inches) soil volumes. This type of EC sensor works on the principle of Electromagnetic Induction (EMI). These types of sensors do not directly make contact or penetrate the soil surface. 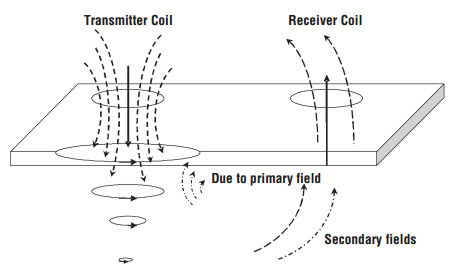 The instrument consists of a transmitter and a receiver coil (Figure 2) usually installed at opposite ends of a non-conductive bar located at opposite ends of the instrument. Figure 2. Principle of operation for a non-contact type EC sensor. The EM38 (Geonics Limited) and GEM-2 (Geophex) are two popular models of non-contact sensors (Figure 3). The GEM-2 is a digital and multi-frequency sensor that can operate in a frequency range of 300 Hz to 24 KHz. The GEM-2 is capable of measuring EC at different depths. The EM38 uses a single frequency providing the ability to measure down to 5 feet (horizontal dipole mode) or 2.5 feet (vertical dipole mode). These sensors are typically mounted on a cart and pulled across a field to collect data. Figure 3. A GEM-2 (a) and EM-38 (b) non-contact EC measurement sensors. not compacted (very loose soil) or extremely compacted. Consider the amount of residue on the ground. Good soil-to-sensor contact is needed for a contact-based system or consistent biomass or bare earth for a non-contact system. A smooth ground surface is preferred. Collecting data after soybean harvest provides a good opportunity, if not too dry or wet. Moisture is the primary means to conduct electricity in the soil but other factors also exist and influence soil EC measurements. Some of these factors were outlined by Doerge et al. (1999) and are summarized below. Water content – Water contains ions that can conduct electricity. Therefore, a dry soil will have lower conductivity or soil EC than a wet soil. Porosity – Porosity can impact the conduction of electrical current in the soil by providing more space for water. Therefore, higher soil porosity increases the potential of conducting electricity when wet. High clay content will have higher EC values than sandier soils due to moisture retention. Finally, soil compaction will tend to increase soil EC. Soil Texture – A particle that has a high surface area and more pore space tends to have a higher conductivity, directly influencing yield potential. This is why clay generally has a higher conductivity than sandier soils. Modern EC sensors have the capability to identify areas of the soil that are characteristic of clay or characteristic of sand, giving a depiction of topsoil depth. Salinity level – The level of salts in soil water (salinity) will significantly increase soil EC measurements. Soil salinity is low across most of the Midwest U.S.
Cation exchange capacity (CEC) – Mineral soil containing high levels of organic matter (humus) and/or 2:1 clay minerals such as montmorillonite, illite or vermiculite have a high ability to retain positively charged ions (such as Ca, Mg, K, Na, NH4, or H). The presence of these ions in the moisture-filled soil pores will enhance soil EC as salinity does (Doerge et al., 1999). Temperature – Soil temperature can directly affect EC measurements but mainly around or below freezing temperatures. Soil EC measurements will decrease some as the soil temperature nears the freezing point of water. Below freezing, soil pores become increasingly insulated from each other and overall soil EC declines rapidly (Doerge et al., 1999). The primary use for Precision Ag practitioners of soil EC has been delineating management zones. However, the information provided by EC data can be useful for a variety of applications (Table 1). Table 1. Possible uses and applications of soil EC and mapping (adapted from Doerge et al., 1999). Directed or smart soil sampling Soil texture, organic matter, CEC, drainage conditions. Variable-rate seeding Topsoil depth, CEC, soil productivity, organic matter. Variable-rate nutrient application based on soil productivity Depth to claypan subsoil or parent material, soil texture, drainage conditions. Spot or targeted herbicide application Soil texture and organic matter. Interpretation of yield and as-planted maps Soil factors that most influence yield, particularly plant-available water content. Fine-tuning of NRCS soil maps by refining soil type boundaries and identifying unmapped inclusions All soil factors. Guidance for placement and interpretation of on-farm tests All soil factors. Soil salinity diagnosis Electrolytes in soil solution. Drainage remediation planning Water holding capacity, sub-soil properties, water content. As a vehicle equipped with an EC measuring device traverses a field, data are collected typically at one-second intervals. These data are recorded to a file and stored on a compact flash (CF) card or similar digital memory device (e.g., thumb drive). A soil EC data file from a Veris unit will contain at least four columns of data (Figure 4). The first and second columns contain the longitude and latitude information for each data point. The third and fourth columns contain the EC data at shallow depths and deep depths, respectively. Elevation can also be collected with some systems. Figures 5a and 5b provide maps of raw EC data collected across a field. They show both the paths the vehicle traveled through the field and the EC variation for shallow depths (with green as high soil EC and red as low). In this example field, 30-foot swaths were used to collect data. Most Farm Management Information Systems (FMIS) and GIS software packages can create soil EC maps that can then be combined with other spatial layers for field-level analyses or within spatial models. Figure 4. 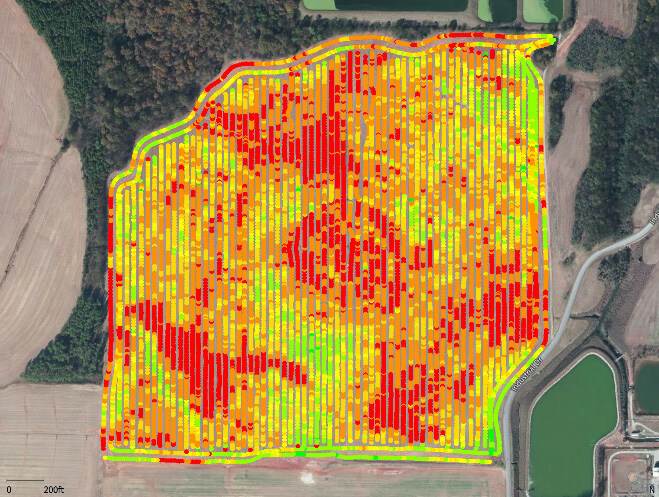 Example soil EC data collected using a Veris Technologies 3100. These data can be plotted as point data using GIS or Farm Information Management System (FMIS). The simplest way to interpret an EC map is to compare it with other maps (e.g., yield, soil, elevation, etc.) of the same site with similar sampling patterns or resolutions. This step may provide useful insight into the relationship between EC, yield-limiting factors, physical properties of soils and possibly establishing the yield potential for a field. The important characteristic of soil EC maps is to look for patterns within fields and investigate the cause of the patterns. Most likely, the patterns depicted are caused by soil properties such as texture and organic matter. Therefore, a quality soil EC map for a field will be accurate over time unless soil properties significantly change due to drainage installation, land leveling or extensive tillage operations. Another way to interpret an EC map is to divide the map into grid cells and compare the average of one cell with the value of the same cell on a map (for example: elevation and plant population). Geostatistical methods can be employed to find the similarities among different layers and to obtain relationships between EC and yield or with certain soil characteristics. If there is a similarity between yield variation on the yield map and EC variation on the EC map, it could be an indication that the soil physical properties are the main cause of yield variation; in particular, water holding capacity and texture. Figure 5. Actual field traverse using a nominal 30-foot swath width plus resulting raw soil EC data collecting across a field; (a) represents the shallow, zero-to-1 foot map and (b) illustrates the deep or zero-to-3 foot map. Red points represent low values (less than 10 μS/cm) up to green areas representing high soil EC values (greater than 20 μS/cm). Figure 6. Interpolated shallow EC data presented as a gridded map (a) and contour map (b) created using the data from Figure 5a. Red represents low values (less than 10 μS/cm) up to green areas representing high soil EC values (greater than 20 μS/cm). The EC value is a combined result of physical and chemical properties of soil. Most EC sensors can measure the electronic potential of the soil, and there are separate sensors also for pH and organic matter. The components and characteristics of the soil, specifically those measured by an EC sensor, can influence what prescription an area of a field requires. It important to note, however, that the correlation between conductivity and crop production is not linear. Data should be used in conjunction with historical productivity, soil samples and local agronomic knowledge in order to accurately use the EC sensors and depict the soil’s characteristics. For instance, it has been demonstrated that fields mapped several times during the year with varying moisture contents had soil EC value changes but the zone delineation did not. Therefore, EC can be used as a tool to determine the relative variation in soil properties within a field and then incorporated with soil samples and past measurements to determine water holding potential/efficiency. 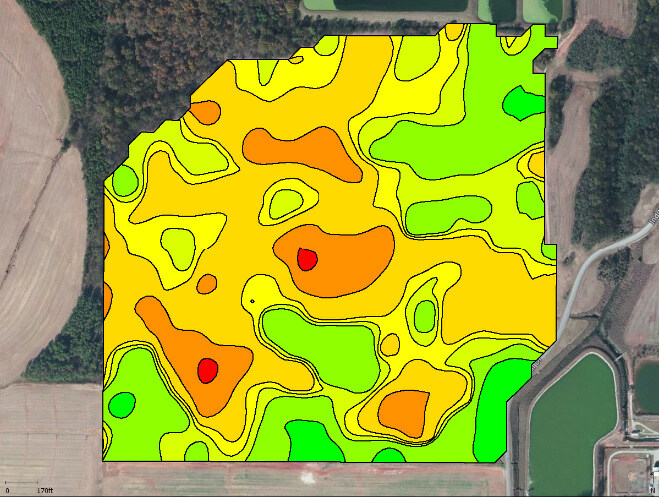 A benefit of soil EC mapping can be that it indicates where a change in soil conditions occurs and which areas may need more attention. 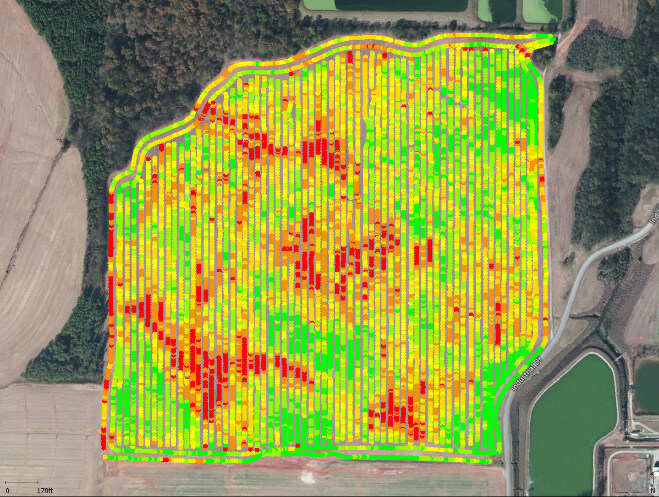 Soil EC data has potential applications in precision agriculture for management decisions and the delineation of management zones. Besides precision nutrient management, these sensors also assist with irrigation management by depicting changes in water content (aces.edu). For precision agriculture applications, EC information works best when yields are primarily affected by factors that are best related to EC; for example, water holding capacity, salinity level, depth of topsoil, pH and so on. As a result, it may not work well in areas when other factors (such as disease, pests, etc.) are more predominant. The data measured by the sensor may be a map of momentary changes based on other factors outside of the sensor’s scope. After a large-volume application of manure or biosolids, the conductivity values would increase, depicting an inaccurate conclusion. To reduce this type of error, try to map the soil after harvest in smooth fields or before planting in a prepared field. Visit The Ohio State University’s Precision Agriculture website (precisionag.osu.edu) and Agronomic Crops website (AgCrops.osu.edu) for additional Precision Ag information. This publication was originally published in 2002 by Dr. Reza Ehsani and Matthew Sullivan but has been updated by the authors.